I have seen the original Prisoner series a few times now. I heard nothing but bad things about the ‘remake’, but I still wanted to see it. I must say, I was not disappointed at all! Perhaps this is because I had no expectations. Also I tried to not see it as a remake, but as an “update” as IMdB has it and it is no remake. Perhaps I can state that it is an interpretation since the 2009 version explains things that the 1970’ies version does not. Elements of the original series remained in the new. Rover is still a big, white globe. Number 6’s rooms have these round walls. The Village is still called The Village. Other elements have been drastically changed. The Village now lays in the middle of some desert. The Green Dome has become a Hospital. Number Two remains the same person. Also elements have been added. Number 6 has a ‘partner’. There are explaining flashbacks. The Village has become quite cosey with pubs and discos. Number 2 has a son and a wife. The remake has in some ways the same atmosphere, a slightly surrealistic ‘what’s real’ atmosphere, but the futuristic elements have been skipped. Especially the last two episodes remind of the weird final episodes of the old version, but the craze is somewhat different and the result certainly is. Perhaps the 2009 version is clearer of says something that the old version does not. As I said, this new version may be an interpretation of the old, which is interesting in a way. Actually it may be better not to compare the old to the new Prisoner at all, but when you do, the new version gives some nice things to think about the McGoohan version. For those who never saw the 1970’ies series, number 6 is a man who wakes up in a village that he cannot leave, however much he tries. The whole village seems to be created to make him say something that he will not (in the 2009 version the purpose of The Village is somewhat ‘larger’). This results in cat-and-mouse games, psychological experiments and everything in between. Some of these things are obvious, others are subtle, yet others ‘far out’. The 2009 series has six episodes. For some reason IMdB does not list a director. It looks a bit 50’ies (like the original) and however not as much as the original, has some critical notes on society, especially towards the end. Like I said, I was not disappointed. 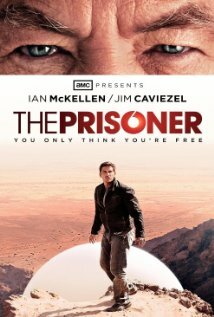 The Prisoner 2009 is not a blazing masterpiece, but an enjoyable mini series and especially the last two episodes are definately worth the time. Also, if you do not watch the new version as an Americanised version of the old, but as a new interpretation, the new Prisoner certainly makes an interesting contemplation. Also the 2009 version is not just a corny American overly-explaining like I feared it would be. Some questions that are left unanswered in the old version are explained, but many other questions are left open and the end is pretty confusing.